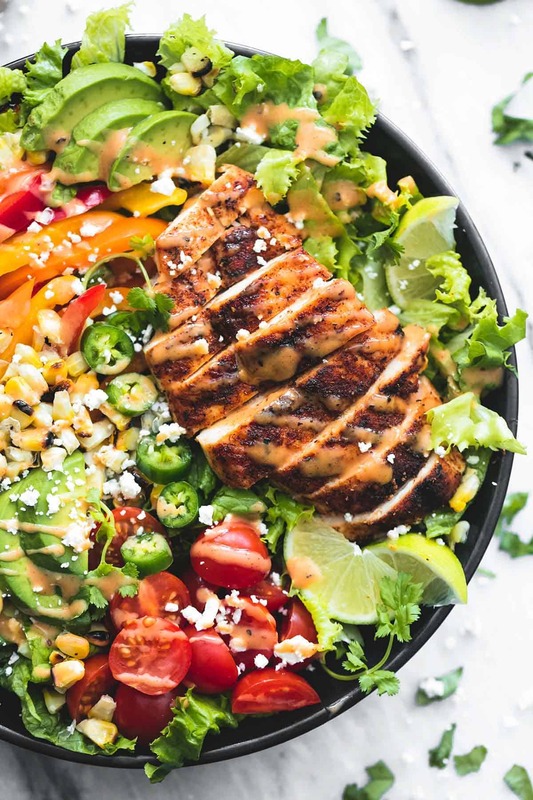 Easy fiesta lime chicken salad with chipotle dressing is perfect for healthy dinners on busy weeknights and summer grilling. It’s mid-May and my summertime grilled chicken salad game is already on fire you guys. I am one hundred percent not kidding when I tell you that we had grilled chicken (and one steak) salads every. single. day. last week. I almost felt bad for my husband – almost. I would have felt a little bit guilty but the one night I made grilled chicken with a side salad, he ended up topping his side salad with his grilled chicken anyway soooooo yeah. I don’t really feel bad at all. That doe say something about my grilled _____ salads though if he wants them every single night right? Gotta be good. If you are reading this, because you are really awesome and like to hear about my boring grilled chicken dinner habits, will you please do me a huuuge favor and comment below telling me the BEST thing you have ever grilled in your lifetime? What is the most delicious grilled thing you can imagine? Because whatever it is, I want to make THAT. No but really, I’m going to put it on my menu for next week so s p i l l.
This salad is my current obsession. I can’t gush enough about the flavors involved in this salad. But with all of that flavor going on, there’s really only a few different spices being utilized here so your ingredient list isn’t a million miles long. You’re going to be using those spices twice – once on the chicken, and once in the dressing. BRILLIANT right?!? I know. My finest stroke of genius right here in the shape of a salad. 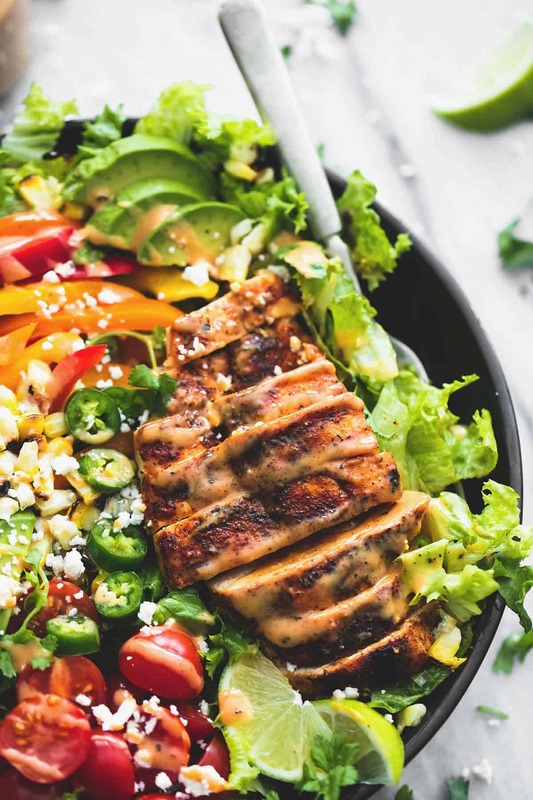 Easy fiesta lime chicken salad with chipotle dressing is perfect for healthy dinners on busy weeknights and summer grilling! Season chicken with salt and pepper on both sides, and season with 1 teaspoon chili powder, 1/2 teaspoon garlic powder, and 1 teaspoon cumin. Grill or cook on the stove in a greased skillet over medium heat for 5-8 minutes on each side until cooked through. Slice and set aside. In a blender or food processor combine mayo, milk, greek yogurt, chipotle pepper, lime juice, and remaining cumin, chili powder, and garlic powder. 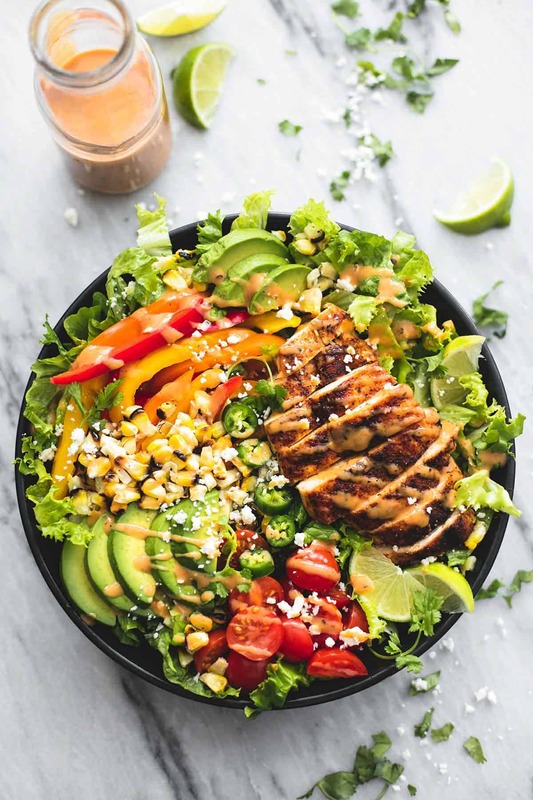 Assemble salads with lettuce on the bottom and top with chicken, tomatoes, peppers, jalapeños, avocado, cheese, and corn (see note). Drizzle with dressing and serve with lime wedges for serving. I grilled my corn because I love love grilled corn. If you want to grill yours, just brush your corn with a bit of olive oil, sprinkle with salt and pepper, and grill over medium-high heat for 6-8 minutes, turning throughout til some of the kernels are blackened. hey girl this looks so yummy! I just love burgers on the grill! SO good! Yummy salad! On the menu for this week! We actually just got a grill so we have been experimenting like CRAZY! My favorite so far has to be the Soy Vay “Very Very Teriyaki” marinated chicken. It is the best store bought teriyaki I’ve ever tried and it grills out beautifully. I know you’re a sauce person so I think you would love it too! I can never get enough of big, bold, punch-you-in-the-face-with-flavor salads like this one. LOVE every single part of this! Absolute favorite is grilled scallops using a BBQ pit Boyz recipe. It’s got lemon, garlic brown sugar, paprika. Oh my goodness! This was amazing! Thank you! My favorite grilled chicken recipe is Indian-influenced and so moist! It’s called Yogurt Chicken and I haven’t met anyone yet who doesn’t like it. You may have one like it but if you don’t, you ought to try it. This is the first time I’ve checked out your website. I love the name of it. So creative and fun! 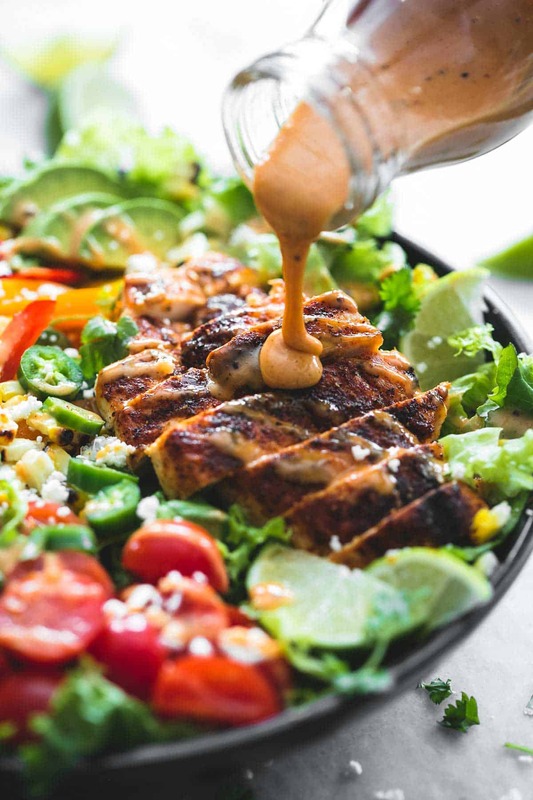 Just came across this recipe while trying to up my salad game this summer! Best thing I ever grilled were peaches that were then added on top of a boxed yellow cake made on the grill for my birthday (no working oven doesn’t mean no birthday cake!!) Grilled some peaches right on the heat, others wrapped in foil so that all that gooey goodness could be drizzled on top! Who needs frosting… or ovens?! They’re overrated! i love ur pictures, can i use this fiesta picture on my menu plzzz? Happy to hear that you loved it!